The United States will withdraw all support from the International Criminal Court, National Security Adviser John Bolton announced Monday, condemning the body as an "assault" on the U.S. Constitution and American sovereignty. In his first public address since joining the Trump administration in April, Bolton called the court "antithetical to our nation's ideals" and pledged to "use any means necessary" to protect the United States and its allies from "unjust prosecution by this illegitimate court." "We will not cooperate with the ICC," Bolton said at an event Monday hosted by the conservative Federalist Society. "We will provide no assistance to the ICC. We will not join the ICC. We will let the ICC die on its own. After all, for all intents and purposes, the ICC is already dead to us." Bolton's remarks come nearly a year after the ICC prosecutor asked to investigate alleged war crimes committed by U.S. service members and intelligence officials who served in Afghanistan. Bolton rejected the claims as "utterly unfounded" and unjustified. Bolton threatened sanctions and a ban on travel to the United States against judges and prosecutors involved in attempted tribunals of Americans or Israelis. Countries that cooperate with ICC prosecutions against the United States and its allies risk losing foreign aid. The United States may also negotiate more binding bilateral agreements to bar nations from surrendering American citizens to the international court. Set up in 2002, the court was meant to prosecute war crimes, crimes against humanity, and genocide. More than 120 countries are members, but the United States, China, and Russia never signed up. 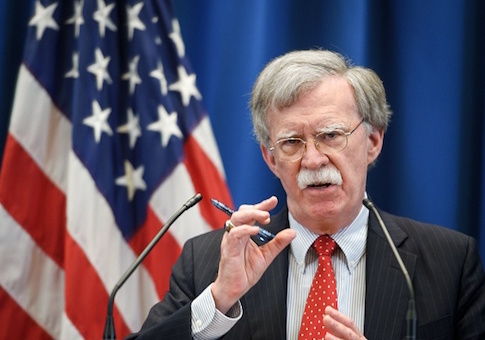 "In theory, the ICC holds perpetrators of the most egregious atrocities accountable for their crimes, provides justice to the victims, and deters future abuses," Bolton said. "In practice, however, the court has been ineffective, unaccountable, and indeed, outright dangerous." "Moreover, the largely outspoken, but always central aim of its most vigorous supporters was to constrain the United States. The objective was not limited to targeting U.S. service members, but rather America's senior political leadership and its relentless determination to keep our country secure." Bolton's speech comes on the heels of a State Department announcement that the Trump administration will close the Palestine Liberation Organization office in Washington, D.C. The decision marks the latest in a pressure campaign to bring the Palestinians to the negotiating table as the Trump administration readies a much-anticipated peace proposal. The Palestine Liberation Organization office served as an embassy in Washington, D.C., for Palestinians. The White House has not said when the office will officially shutter. This entry was posted in National Security and tagged John Bolton. Bookmark the permalink.